Watermelon juice works as a great natural toner for your skin. In addition, it helps cure acne and blemishes. Being loaded with antioxidants, it prevents free radical damage and hence fights the signs of aging. Plus, as watermelon is considered good for exfoliating the skin as it is rich in malic acid. The simplest way to derive the beauty benefits of this fruit is to rub watermelon pulp on your skin and rinse it off after 15 minutes. Applying a combination of watermelon juice and honey benefits dry skin. In case you have oily skin, add a little witch hazel instead of honey. • Soak a cotton ball in watermelon juice mixed with mint juice. Gently rub it on your face and neck, and wash it off after 15-20 minutes to rejuvenate your skin and close open pores. • Regularly applying a mixture of watermelon pulp, grated cucumber, and rice flour or milk powder enough to form a paste for about 20 minutes is beneficial for fading suntan over a period of time. • Another home remedy to cure sunburn involves the use of a face pack prepared by mixing one and a half tablespoons of fuller’s earth, two tablespoons of watermelon pulp, and half a teaspoon of honey. • Make a body scrub by blending a cup of watermelon pieces in a blender or food processor and adding a cup of granulated sugar and two tablespoons of lemon juice in it. 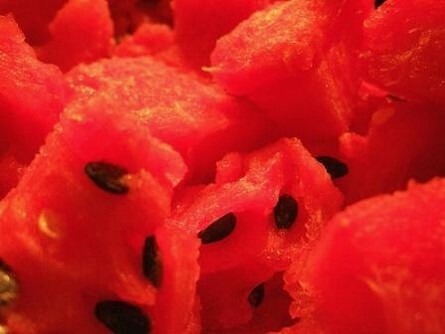 • Combine a cup of watermelon pulp with half a banana (mashed) and half a cup of plain yogurt. Keep the recipe in the refrigerator for about an hour. Finally, apply it on your skin and wash it off after 15-20 minutes to get soft, smooth, and glowing skin. It is also beneficial for healing acne and blemishes. • Blend a quarter cup of watermelon cubes along with a quarter cup of plain yogurt, a teaspoon of aloe vera gel and two drops of lavender oil. Leave this beauty mask on your skin for 15 minutes and then rinse it off to nourish sensitive skin. Here’s a video showing how to make a face mask with watermelon and coffee grounds. • You can moisturize dry, dull skin by using a combination of half a cup of watermelon juice, a quarter cup of milk and a teaspoon of organic honey. • Scoop out the pulp of an avocado, mash it. Next, mix half a cup of watermelon chunks in it and add a teaspoon of vegetable oil in the recipe. Apply this facial mask on your face and neck. Finally, wash it off with lukewarm water after 15 minutes to maintain younger-looking skin and reduce wrinkles. • Simply rubbing the white watermelon rind on your face two times in a week can help treat acne. • Take two tablespoons of watermelon juice and add two tablespoons of fresh lime juice and one teaspoon of organic honey in it. Leave this homemade face mask on your face for 10-15 minutes and then rinse it off with lukewarm water. • Smoothen and brighten your skin by applying a mixture of a quarter cup of watermelon chunks, a quarter piece of grated cucumber and two tablespoons of orange juice. Besides, regular consumption of this delicious fruit facilitates weight loss and helps maintain healthy skin. In addition, it boosts immunity, protects against heart disease, and assists in detoxification of the body.